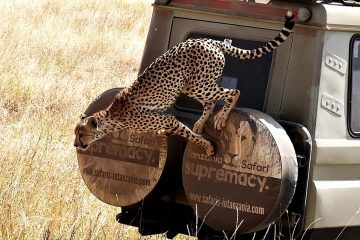 Top class Safari Kenya, Tanzania for 12 Days is what this package is all about. It is no doubt that these two countries; Kenya and Tanzania are the best safari destinations in Africa, and it is by no coincidence that the word safari itself is a Swahili word with all origination tracing from these two iconic safari countries. this is a super safari package that takes you to the most premium game parks and reserves of East Africa. After a fantastic views of the flamingos at Lake Nakuru National Park and a wild venture at Masai Mara you cross the border to Tanzania and head to Lake Victoria the largest freshwater lake in Africa. From here you enter the endless plains of Serengeti National Park before you head to The largest unbroken Caldera in the world; Ngorongoro Crater. Wind up at the Lake Manyara National Park in search of more flamingos and the legendary tree climbing lions. This Safari Package can done by staying in other mid-range or more deluxe accommodations options, or even as a camping Safari. Please let us know if you wish us to customize the package in anyway that will suit your needs and ideas. Arrival at Jomo Kenyatta International Airport In Nairobi you will be met by our Representative who will transfer you to Eka Hotel for overnight. After breakfast we embark on our way north to Lake Nakuru National park about 3 hours drive from the capital city. We arrive for lunch at the lodge then go for afternoon game drive in the national Park in search of the rare white Rhinos and the Rothschild that are endemic to this park only ion East Africa. Many other ungulates to see in the park and the vibrant colors of the flamingos at the lake itself await you for the afternoon. Overnight and dinner is at Lake Nakuru Lodge. All meals included. Early morning game drive is possible if staying in the park and if you wish. After breakfast we are on our way to the most celebrated game reserve in Africa; the Masai Mara Game Reserve. After a brief stop at the gate for registration formalities we drive to the lodge/tented camp for hot lunch with game rives en route. 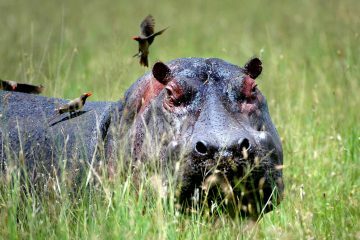 Masai Mara is the home of the big cats and the Big 5 so after lunch we are off to the plains in search of the animals. Overnight at Olumara Camp. All meals included. At dawn you wake up for a morning game drive to see animals to see animals rise for a new day then go back to the lodge/tented camp for breakfast. After breakfast you go back to the wilderness for a full day of game drives. Masai Mara is famous for the Wildebeests Migration where by more than a million and a half herds move in from the Serengeti accompanied by zebras and gazelles in search for pasture and water. If you are lucky and if in time you may as well witness the spectacular river crossing at the Mara River. Dinner and overnight at Olumara Camp. This morning we take an early breakfast then embark on our long way to Lake Victoria via the Isebania border to Tanzania. We will have a brief stop at the border for visa obtaining then head to the shores of Lake Victoria on the Tanzania side. Here you will relax at a nice retreat accommodation by the shores of the largest freshwater lake in Africa, or even take a traditional boat from Musoma Lake side town to an Island Lodge.Here you will take a dip in the warm waters if you wish and relax. Overnight at Spekes Bay Lodge. Early in the morning we join the local fishermen for a boat trip then after breakfast we drive to Serengeti National Park via the Ndabaka gate. We leave with a lunch box and spend the rest of the day in the Serengeti plains in search of the animals. If we missed out on the wildebeests in Masai Mara depending on the time of visit then we are sure to see the herds in the Serengeti National Park. Among other animals we are likely to spot lions, leopards, baboons, zebras, hartebeests, elephants, warthogs and many bird species. Overnight at Kisura Tented Camp. All meals included. This day is pent in the Serengeti plains. If you wish you may go for a predawn game drive to see animals in the African rising sun. Today we have the option of doing a morning and sunset games drives only then relax at the lodge or camp if you wish so. Dinner and overnight at Kisura Tented Camp. All meals included. Serengeti – Ngorongoro Conservation Area. After breakfast we check out and go on with game drives on our way out of the Serengeti via Naabi Hill Gate and enter the Ngorongoro Conservation Area. We will have a brief stop at a Masai Village on our way uphill to the Ngorongoro Crater Rim. In the afternoon we will check in at the lodge and relax , or take a dip in the swimming pool to cool off from the African sun. If you are into activity then this is the time to go for a ranger guided nature walk in the forest. It is possible to bump into zebra herds, buffaloes, duikers etc but the Ranger will be armed with a rifle so need to panic! Dinner and overnight at Rhino Lodge. All meals included. An early morning game drive is inevitable because today we are descending into the wonderful largest unbroken caldera in the world also referred to as the Eden of Africa or the eighth wonder of the world. With unmatched concentration of animals the crater floor will never stop amazing you with animals at very close range and if you are a little lucky; you will spot the big 5 in a single day. 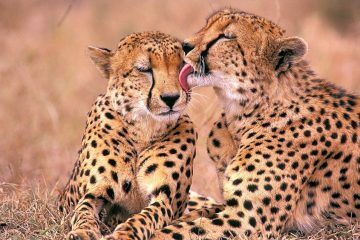 Lions, elephants, silver back jackals, black rhinos, spotted hyenas, warthogs, leopards, cheetahs are just a few to mention. Picnic will be offered at the Hippo poolside picnic site. Later in the afternoon you will drive up the Crater Rim for dinner and overnight at Endoro Lodge. All meals included. After breakfast we are hit the road again this time down into the Rift valley floor to the Lake Manyara National Park. This is a small evergreen park with stunning views of the Great Rift Valley walls. The park is fed by underground rivers that ensure an unlimited presence of animals all year round. What makes the park more popular are the flamingos and other varieties of aquatic birds and the legendary tree climbing lions. Overnight is at Rift Valley Lodge.All meals included. This day we are off after breakfast to the third largest national park; Tarangire National Park. This beautiful park is highlighted by the abnormally large herds of gigantic elephants and the massive baobab trees that dot the park. This park is also the home of some of the rarest birds and animals like the Oryx which can be spotted to this park in Tanzania. The Tarangire river is the lifeline of the animals in this park and this turns the river bank into an action field of the wild as animals converge amidst the risk of predators as they come for the valuable drop of water. Overnight is at Sangaiwe Tented Lodge. All meals included. Tarangire National Park - Arusha - Departure. In the morning we go for a morning game drive if you wish then after breakfast you will go for a nature walk at the park boundaries accompanied by a Masai warrior. We will then drive to Arusha town where the Safari ends. From here you can be transferred to Kilimanjaro International Airport for your flight back home. Regional Flights from Kilimanjaro International Airport.